The Starrett PROSITE® Miter Saw Protractor takes error-prone calculations out of the process of miter cuts. Simply set your saw to the angle that you read. Upside down or backwards, the reading is always correct. 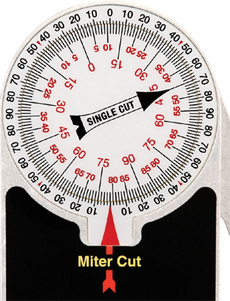 The PROSITE Miter Protractor is made from durable, 1/4” aluminum with Teflon™ ‘O' ring for smooth and precise operation. This innovative tool saves time and reduces waste. It's ideal for carpenters, plumbers and all building trades as well as invaluable for home use.